AACR’s fourth Cancer Progress Report focuses on diagnosis and treatment, but a significant part of the report highlights the research in prevention, using World Cancer Research Fund and AICR findings, along with other data. “Our reports show that simply by eating well, being physically active and maintaining a healthy weight, Americans could prevent tens of thousands of cancer cases each year,” says AICR Vice President of Research Susan Higginbotham, PhD, RD. “This new AACR report shows that there are many other ways we can reduce cancer risk, such as not smoking and reducing sun exposure. "Even as research on prevention advances every year, knowing that we can cut the numbers of cancer deaths in half just with lifestyle choices -– that's empowering." 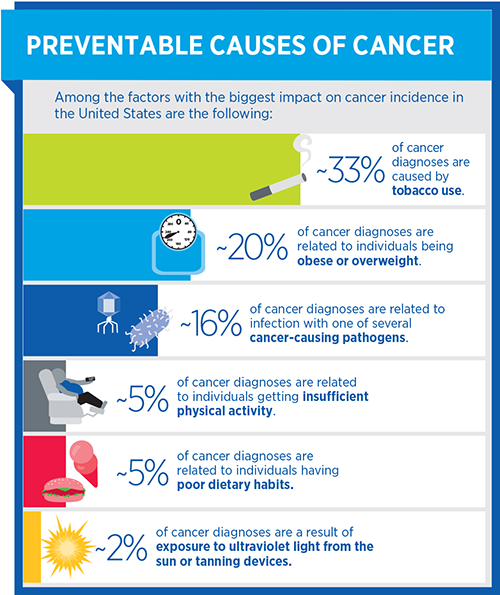 AICR estimates that with changes to diet, activity habits and weight, approximately one of every three cancer cases are preventable. Using data that includes vaccines, sun exposure, smoking and other facts, the AACR report says that more than 50 percent of the 585,720 cancer deaths expected to occur in the United States in 2014 will be related to preventable causes. ffective strategies and policy for healthy lifestyle. Source: American Assoociation for Cancer Research. AACR Cancer Progress Report 2014. Clin Cancer Res 2014;20(Supplement 1):SI-S124. PDF of the report.